Jenna seems to be a little bit on the timid side. She'll try new things but tends to show a little hesitation before she takes it on full strength. Last summer she really liked the water but I was almost certain this summer would be one of me stuck in the water with her all the time holding her....boy was I wrong! Friday we headed to Matt and Lisa's for a pool day. 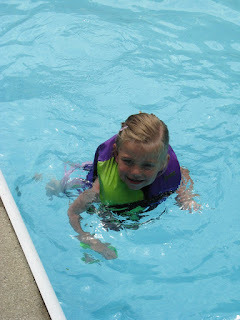 Gracie (almost 4)throws on a life jacket and swims all around so of course Jenna wanted in. I put on her life jacket and we went in. 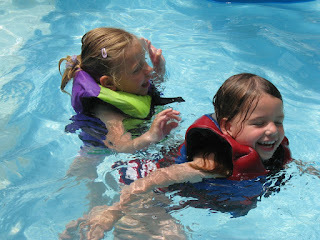 I kept encouraging her and trying to get her to trust the life jacket. After about 5 minutes I let go just to see what would happen. She got a little panicked but realized she wasn't sinking. 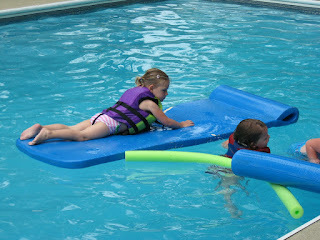 She even went under after falling off the raft and just laughed that her and Gracie got their faces wet. This is going to be a fun summer!